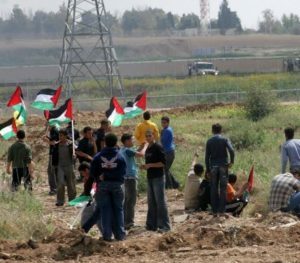 On Friday, Israeli soldiers attacked Palestinian protesters on their lands near the border fence in the northern and eastern parts of the besieged Gaza Strip, and injured at least twenty-five, including eleven who were shot with live fire, while dozens suffered the effects of teargas inhalation. 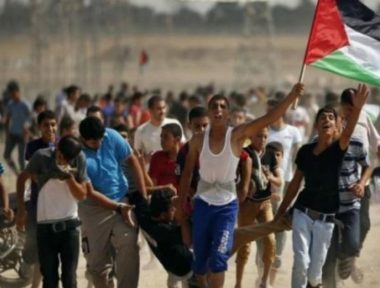 The WAFA Palestinian News Agency said the soldiers, stationed on military towers and in tanks around Nahal Oz military base, across the border fence east of Gaza city, fired dozens of live rounds, moderately wounding at least seven Palestinians, who were rushed to the Shifa medical center. The News Agency added that many Palestinians suffered the effects of teargas inhalation and received treatment. Furthermore, Israeli soldiers shot and moderately injured four Palestinians with live fire, east of Khan Younis city, in the southern part of the Gaza Strip, and caused many others to suffer the effects of teargas inhalation. The wounded Palestinians were rushed to Nasser hospital, and the European hospital, in Khan Younis. Four other Palestinians were also shot with live Israeli army fire, east of Jabalia, in the northern part of the Gaza Strip, and were rushed to the Indonesian hospital. The soldiers also shot one Palestinian with a gas bomb in the head, and four others with live fire, north of Beit Lahia, in the northern part of the Gaza Strip; the wounded suffered moderate injuries. Another Palestinian was shot with live fire near Beit Hanoun (Erez) Crossing, and suffered a moderate injury, before being rushed to the Indonesian hospital, while many others suffered the effects of teargas inhalation, east of the al-Boreij refugee camp, in central Gaza.